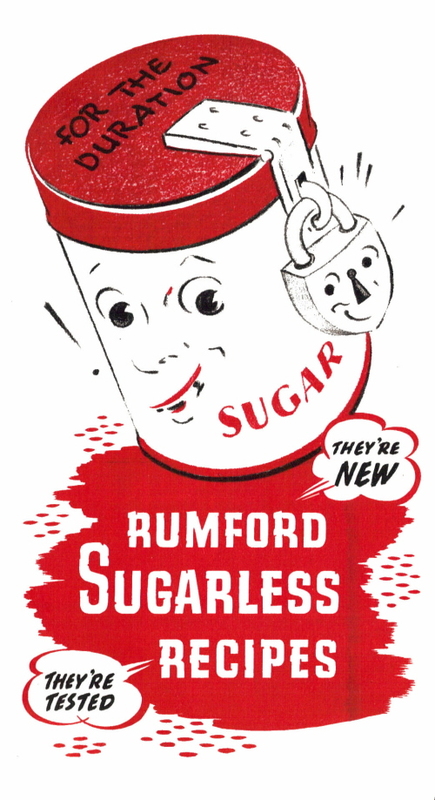 This is a recipe pamphlet handed out by Rumford Baking Powder during World War II when there were food shortages and rations. This little pamphlet provided recipes for sugarless cake, muffins, cookies and a bread recipe. It’s a pull-out pamphlet in pristine condition, but my scanner has darkened the copy so I cleaned up the cover image a bit. Also I had to scan in sections since the full sheet doesn’t fit on my scanner. Click any of the images to view a large copy. When you view your half-empty sugar bowl with alarm . . . when your sugar ration runs short . . . when you pine for a good Rumford cake, shortages or no–that’s the time to dip into this little treasury of Rumford Sugarless Recipes. There’s not a spoonful of sugar in any of them–but they taste mighty good just the same! FOLLOW the recipes given here exactly. The experts have worked out just what happens when you switch to syrups, etc. and you will have best results if you follow directions to the letter. Generally speaking, you can replace one-fourth the sugar in any recipe with corn syrup (although our recipes here use no sugar). Expect a darker color in your cakes and frosting if you use a dark syrup rather than a light one; the dark syrups impart a more golden color. Another thing to expect is slightly different texture from what you’re used to. Remember the cakes your mother made when you were small . . . how they were a little firmer in texture . . . the kind that “stick to your ribs”, as she used to say proudly? Well, there’ll be a little of this in sugarless cake recipes. Don’t be surprised. A lot of people prefer it! 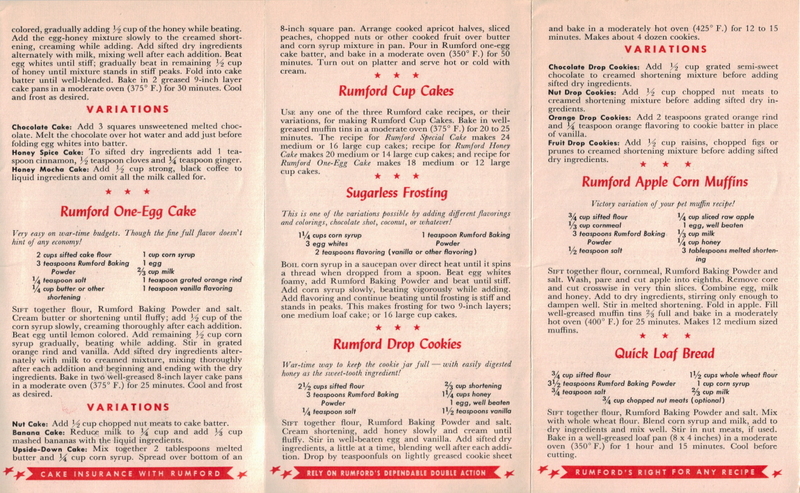 Be sure to use Rumford All-Phosphate Baking Powder in your sugarless baking. This is not “just advertising”–the fact is that sugar tends to mask flavors. In sugarless recipes the flavor of the other ingredients is more apparent, “comes through” in the finished product. That is why it is important to use Rumford Baking Powder–because this important ingredient is one you should not taste. 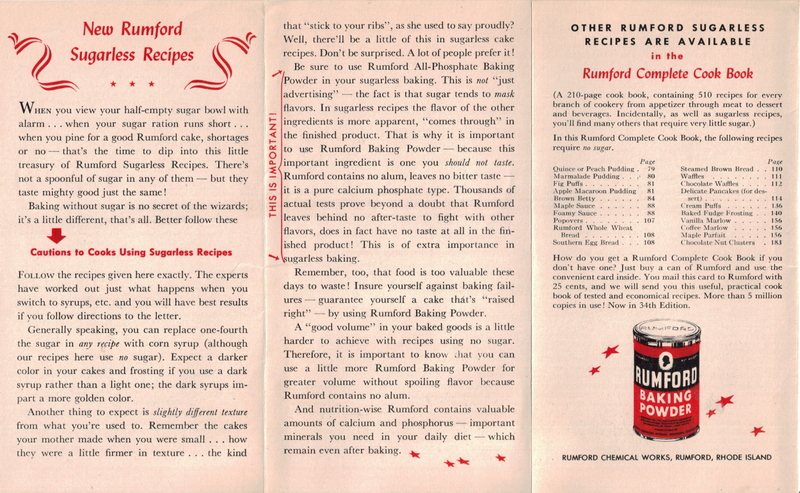 Rumford contains no alum, leaves no bitter taste–it is a pure calcium phosphate type. 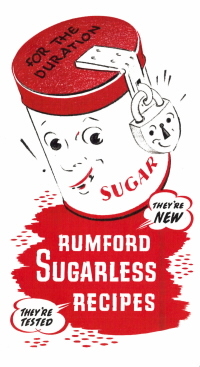 Thousands of actual tests prove beyond a doubt that Rumford leaves behind no after-taste to fight with other flavors, does in fact have no taste at all in the finished product! This is of extra importance in sugarless baking. Remember, too, that food is too valuable these days to waste! Insure yourself against baking failures–guarantee yourself a cake that’s “raised right”–by using Rumford Baking Powder. A “good volume” in your baked goods is a little harder to achieve with recipes using no sugar. 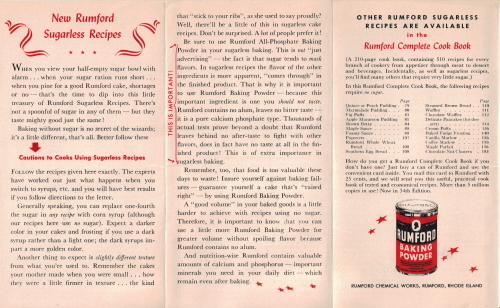 Therefore, it is important to know that you can use a little more Rumford Baking Powder for greater volume without spoiling flavor because Rumford contains no alum. And nutrition-wise Rumford contains valuable amounts of calcium and phosphorus–important minerals you need in your daily diet–which remain even after baking. A cake for a party–particularly good in seasons when eggs are plentiful, though not too demanding at any time. Frost it with the sugarless frosting–flavored with orange! Yellow Cake: Use 6 egg yolks and no whites. Beat second 3 egg yolks with a rotary egg beater until thick and lemon colored and add the remaining 1/2 cup corn syrup gradually, beating constantly. White Cake: Use 5 egg whites and no egg yolks. Beat the egg whites until stiff, then gradually beat in the 1/2 cup corn syrup. Chocolate Chip Cake: Add 2/3 cup semi-sweet chocolate, broken into small pieces, to the cake batter just before folding in the beaten egg whites. Any nutrition expert will tell you about honey’s qualifications as a pure natural sweetening–and you’ll find out that it helps a cake stay fresh longer! SIFT together flour, Rumford Baking Powder and salt. Cream shortening until light. Beat egg yolks until lemon colored, gradually adding 1/2 cup of the honey while beating. Add the egg-honey mixture slowly to the creamed shortening, creaming while adding. Add sifted dry ingredients alternately with milk, mixing well after each addition. Beat egg whites until stiff; gradually beat in remaining 1/2 cup of honey until mixture stands in stiff peaks. Fold into cake batter until well-blended. Bake in 2 greased 9-inch layer cake pans in a moderate oven (375° F.) for 30 minutes. Cool and frost as desired. Chocolate Cake: Add 3 squares unsweetened melted chocolate. Melt the chocolate over hot water and add just before folding egg whites into batter. Honey Spice Cake: To sifted dry ingredients add 1 teaspoon cinnamon, 1/2 teaspoon cloves and 1/4 teaspoon ginger. Honey Mocha Cake: Add 1/2 cup strong, black coffee to liquid ingredients and omit all the milk called for. Very easy on war-time budgets. Though the fine full flavor doesn’t hint of any economy! SIFT together flour, Rumford Baking Powder and salt. Cream butter or shortening until fluffy; add 1/2 cup of the corn syrup slowly, creaming thoroughly after each addition. Beat egg until lemon colored. Add remaining 1/2 cup corn syrup gradually, beating while adding. Stir in grated orange rind and vanilla. Add sifted dry ingredients alternately with milk to creamed mixture, mixing thoroughly after each addition and beginning and ending with the dry ingredients. Bake in two well-greased 8-inch layer cake pans in a moderate oven (375° F.) for 25 minutes. Cool and frost as desired. Nut Cake: Add 1/2 cup chopped nut meats to cake batter. Banana Cake: Reduce milk to 1/4 cup and add 1/3 cup mashed bananas with the liquid ingredients. Upside-Down Cake: Mix together 2 tablespoons melted butter and 1/4 cup corn syrup. Spread over bottom of an 8-inch square pan. Arrange cooked apricot halves, sliced peaches, chopped nuts or other cooked fruit over butter and corn syrup mixture in pan. 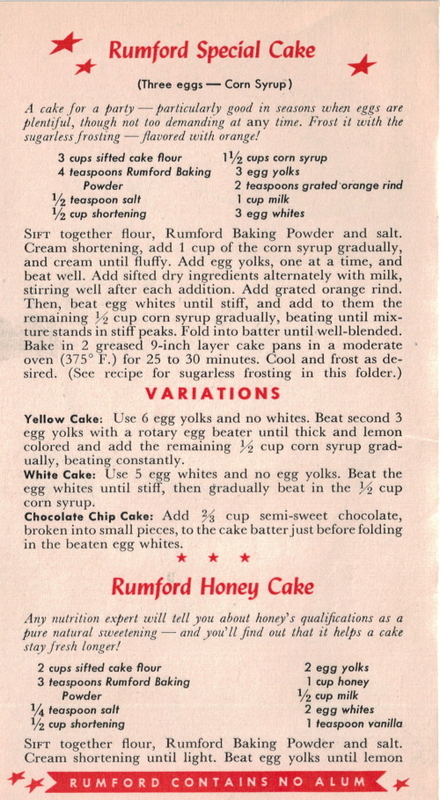 Pour in Rumford one-egg cake batter, and bake in a moderate oven (350° F.)for 50 minutes. Turn out on platter and serve hot or cold with cream. 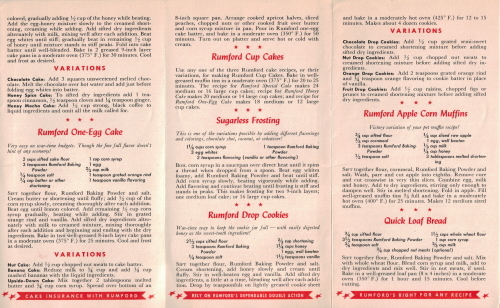 USE any one of the three Rumford cake recipes, or their variations, for making Rumford Cup Cakes. Bake in well-greased muffin tins in a moderate oven (375° F.) for 20 to 25 minutes. 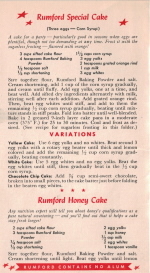 The recipe for Rumford Special Cake makes 24 medium or 16 large cup cakes; recipe for Rumford Honey Cake makes 20 medium or 14 large cup cakes; and recipe for Rumford One-Egg Cake makes 18 medium or 12 large cup cakes. This is one of the variations possible by adding different flavorings and colorings, chocolate shot, coconut, or whatever! BOIL corn syrup in a saucepan over direct heat until it spins a thread when dropped from a spoon. Beat egg whites foamy, add Rumford Baking Powder and beat until stiff. Add corn syrup slowly, beating vigorously while adding. Add flavoring and continue beating until frosting is stiff and stands in peaks. This makes frosting for two 9-inch layers; one medium loaf cake; or 16 large cup cakes. War-time way to keep the cookie jar full–with easily digested honey as the sweet-tooth ingredient! SIFT together flour, Rumford Baking Powder and salt. Cream shortening, add honey slowly and cream until fluffy. Stir in well-beaten egg and vanilla. Add sifted dry ingredients, a little at a time, blending well after each addition. Drop by teaspoonfuls on lightly greased cookie sheet and bake in a moderately hot oven (425° F.) for 12 to 15 minutes. Makes about 4 dozen cookies. Chocolate Drop Cookies: Add 1/2 cup grated semi-sweet chocolate to creamed shortening mixture before adding sifted dry ingredients. Nut Drop Cookies: Add 1/2 cup chopped nut meats to creamed shortening mixture before adding sifted dry ingredients. Orange Drop Cookies: Add 2 teaspoons grated orange rind and 1/4 teaspoon orange flavoring to cookie batter in place of vanilla. Fruit Drop Cookies: Add 1/2 cup raisins, chopped figs or prunes to creamed shortening mixture before adding sifted dry ingredients. Victory variation of your pet muffin recipe! SIFT together flour, cornmeal, Rumford Baking Powder and salt. Wash, pare and cut apple into eighths. Remove core and cut crosswise in very thin slices. Combine egg, milk and honey. Add to dry ingredients, stirring only enough to dampen well. Stir in melted shortening. Fold in apple. Fill well-greased muffin tins 2/3 full and bake in a moderately hot oven (400° F.) for 25 minutes. Makes 12 medium sized muffins. SIFT together flour, Rumford Baking Powder and salt. Mix with whole wheat flour. Blend corn syrup and milk, add to dry ingredients and mix well. Stir in nut meats, if used. Bake in a well-greased loaf pan (8 x 4 inches) in a moderate oven (350° F.) for 1 hour and 15 minutes. Cool before cutting. the good old days » Blog Archive » Retro Recipe Attempt: let them eat honey!